Friday's first-ever Indigenous People's March in Washington should have been an occasion for peaceful protest and respectful acknowledgment of Native Americans' experience in our country. Instead, a sad and unfortunately predictable confluence of events made that sort of dignified reflection impossible. 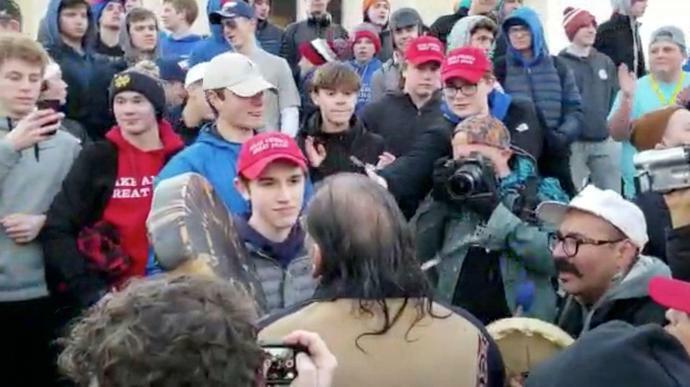 The group of high school boys from Kentucky's Covington Catholic High School, seen on tape wearing "Make America Great Again" hats and ridiculing some of the marchers, including U.S. veteran Nathan Phillips, should be accountable for their actions. Phillips says he approached the boys because they were already exchanging racial taunts with another group of protesters and he was was trying to calm things down. However, the subsequent debates over the exact sequence of events and the question of whether the students should be identified don't place responsibility for the ugly scene on the people who should really assume it: the adults. That includes the adults on the other side who exchanged insults with the students, of course. But the adults with the most knowledge and control over the situation were the supervising adults from Covington. They saw what the students wore as they walked out of their hotel lobby that morning. For many in this country, MAGA hats amount to an explicit message of racial intolerance and bigotry, and the chaperones should have known the boys' appearance had the potential to inflame and frighten others, particularly on this day of marches. Combine that with the common belief of teen boys in their absolute right of freedom of speech and expression, their ignorance of how they appear to others, and the emboldening effect of a large group, and the whole thing was entirely foreseeable. For the rest of us, we have to put aside our righteous indignation. Instead, we need to remember the value of dignity for everyone. Remember that it's possible that at least some of Covington's parents, teachers and administrators are horrified and ashamed. And when we move on to the next terrible story that captures our attention, they will be left to deal with the consequences, including the fact that they have been on the receiving end of hate since the video of the boys was posted. With that in mind, I am respectfully reaching out. We know there are many wonderful children who attend your school and this one incident does not reflect every individual in your community. But it is also true that your students mocked an elderly Vietnam veteran while the supervising adults allowed them to represent your school wearing MAGA hats. Is this not a moment to examine your school's goals and values for how you send an all-male group of students to participate in March for Life, an event that should by all accounts recognize the importance of treating all people with dignity, especially those with whom you disagree? As it is, the image of young men protesting against women's reproductive rights, coupled with their MAGA mobbing of an elderly Native American man, only looks like young men wanting to dominate people who have historically had less power. I am sure you want your students to be more than that. This is your moment to show the country what educators and parents do for young people. This is your moment to show children that they aren't only "ours" when they bring home trophies. They are ours when they make mistakes. This is your moment to teach boys that the right to express themselves is not as important as treating all people with respect, that political disagreement does not give them the right to disparage and ridicule others. To the school's leaders: Ignore the ugliest of the online commentary and focus on your boys. Go to Mr. Phillips and apologize on the boys' behalf. When you return, stand in front of them at a schoolwide assembly and share what that experience was like and how you see yourselves as their spiritual and educational leaders. Show them what ethical leadership looks like in action. After that, examine what about Covington's environment may have led to this moment. If it is as it appears, that Covington has an overwhelmingly or entirely white faculty, you are sending a powerful message to your students about who deserves respect and who doesn't. This is not being politically correct. It is about whether your students' education includes seeing people who don't look like them in positions of authority and respect. If the institution doesn't have women and people of color in positions of authority, then the message is clear: They don't matter. When the students are out in the world, their actions will reflect what they have been taught. Please see this moment for what it is ― a time to guide these young men through the process of personal accountability and steer them toward acting with civility and honor. This is an opportunity for your community to honestly face how these young men were allowed to conduct themselves in a public space in a manner so disrespectful to others and so clearly against the stated mission and values of your school. It is not a time to close off and grow defensive or dismiss the boys' actions. It is a time to remember that guiding these boys through this is where your leadership matters the most. I know you want these young men to graduate and contribute to the world, to leave it better than when they came in. You want them to be a credit to your institution and your community. So use this experience to teach them how to help repair the world we all share. Have these courageous conversations. Let everyone in the country see that Covington Catholic is a school community that does what's right ― even when it is hard. Rosalind Wiseman is a teacher and the best-selling author of Masterminds & Wingmen and Queen Bees & Wannabes, the book that inspired the movie "Mean Girls." She is the creator of the curriculum Owning Up: Empowering Adolescents to Confront Social Cruelty, Bullying, and Injustice and the founder of Cultures of Dignity.